Onmyo-Za(also Onmyouza or Onmyoza) are a Japanese Visual Kei / heavy metal band who released their first commercial album in 1999. 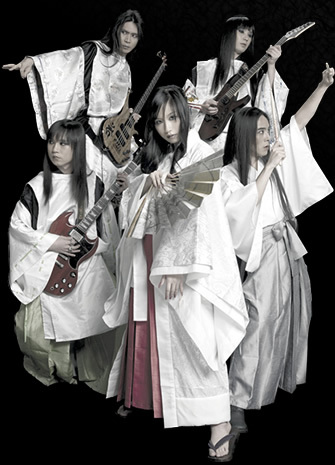 They play heavy metal music mixed with Japanese folk / pop musical elements. They are also categorized as a Visual Kei band for their theatrical live performance with kimonos. Each of their stage names has double meaning with a sense of humor. Kuroneko(黒猫) literally means a black cat, just symbolizing her personality. Matatabi(瞬火) is a flashing fire, but it can also be read as a silvervine(loved by cats). Maneki(招鬼) practically　means "summoning oni", but its reading reminds most Japanese people of maneki neko. Karukan(狩姦) is not clear in its literal meaning, though Karu(狩) independently means "attacking" or "hunting" and Kan(姦) is "adultery" or so. But its reading is familiar to Japanese people, as a brand name of cat food. Tora(斗羅) has little literal meaning, but its reading is same to tiger in Japanese. This suggests also that he is a fan of Hanshin Tigers. So, all their stage names are related with a cat. And it forms an image that the four members are following their heroine. Their songs mainly deal with oni, yokai, Japanese dragons etc, but some songs have a more concrete theme and inspiration. For example, Onmyo-za has composed 10 Ninpocho songs. "Ninpocho" means "tales of ninja magic", these songs are a tribute to the Japanese author Futaro Yamada and his Ninpocho series. 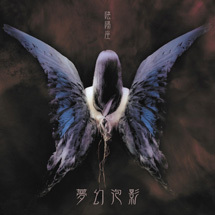 Koga Ninpocho, the latest Ninpocho song, was written for the anime "Basilisk" which story was from Futaro Yamada's "Koga Ninpocho". There are also some other songs inspired by Osamu Tezuka and Kyogoku Natsuhiko. The trilogy "Kumikyoku Yoshitsune" is based on the legend of Japanese ancient tragic hero Minamoto no Yoshitsune.